The quad was the first antenna ever to pop up in full use without a lot of research and engineering. It was made to solve a problem with corona discharge from a beam antenna at 10,000 feet in the mountains of Equador. The antenna tips were melting during transmissions. The solution was to have no end to the antenna. The first trial worked out and the station stayed on the air. The engineers had originally tried putting copper balls on the end of the beam with some success and this gives amateurs the first advantage to using a quad. The same principle that reduced the corona discharge also reduces receive static. The balls on the end of your car antenna are not just there so you don't poke your eye out! Quad input impedance can be changed just by changing the spacing between the elements. POINT 2 Quads can be designed for any impedance. Baluns ,coils and capacitors are all lossy. They may have an efficiency factor of 80% or less. POINT 3 Quads can be directly fed. The bandwidth of yagis gets narrower and narrower as you add more elements. POINT 4 A properly designed quad actually will get more broadband with more elements. POINT 6 An error of 1/16 of an inch on a uhf yagi is a big mistake. On a quad loop the same error is only 1/2 of the mistake. Anyways the quad is more forgiving of errors. Remember to stretch the wire before measuring and if you must err, make the reflector long and the directors short. BAD POINTS. Quads had a bad reputation in the past for being unable to withstand severe weather. Well, in the 21st Century, we use fiberglass for spreaders and not old bamboo poles from the carpet stores. The wires always break! Evidently these people have never heard of "FLEXWEAVE" antenna wire. Unlike normal 14 gauge with 7 strands of wire, this wire has maybe a hundred strands woven in several bundles. It is so flexible that you can tie it in a knot and undo it without damage. A very severe Canadian ICE Storm took one of my quads that had been up for ten years. The fiberglass did not break and the wires weren't broken, even though half of the antenna fell 80 feet to the ground and the other half was dangling from the tower. The boom had broken in half! Since most of us use 50 ohm coax, this seems to be the logical choice for antenna impedance. 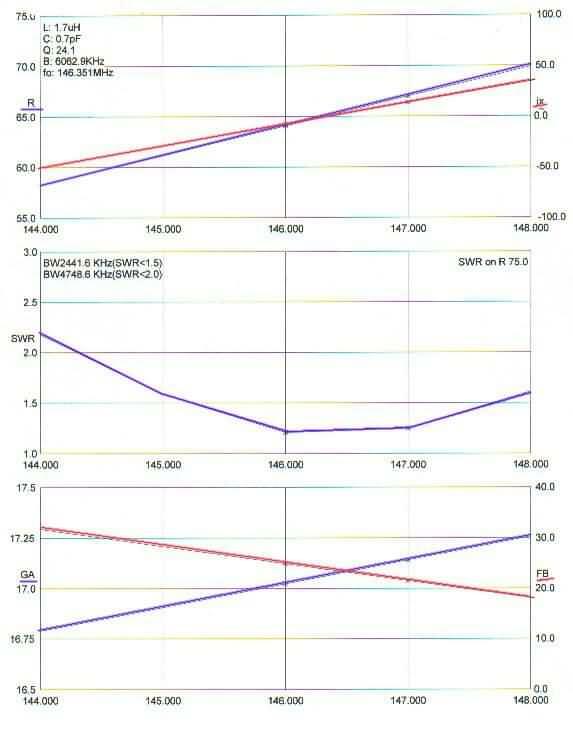 With 50 ohm quads we get the shortest boom but the lowest gain and narrowest bandwith. 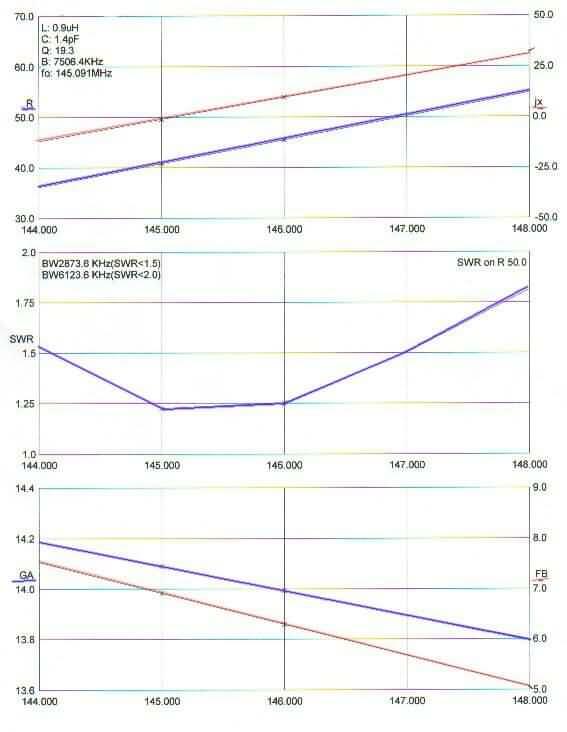 The SWR is better at the low end where most DX is compared to the high end of the band. A 75 ohm quad requires some type of matching but is close to the highest gain. The boom is not that much longer than the 50 ohm quad but the frequency tends to shift a little to the high side. Design it a percent lower in frequency than you want. A 125 ohm quad has the longest boom but is within 1Db of maximum gain. It gives an almost flat SWR across the greatest bandwidth It is easily matched without losses by using a 1/4 wave series piece of 75 ohm coax. For comparison I've modelled an eleven element quad for 2 meters. 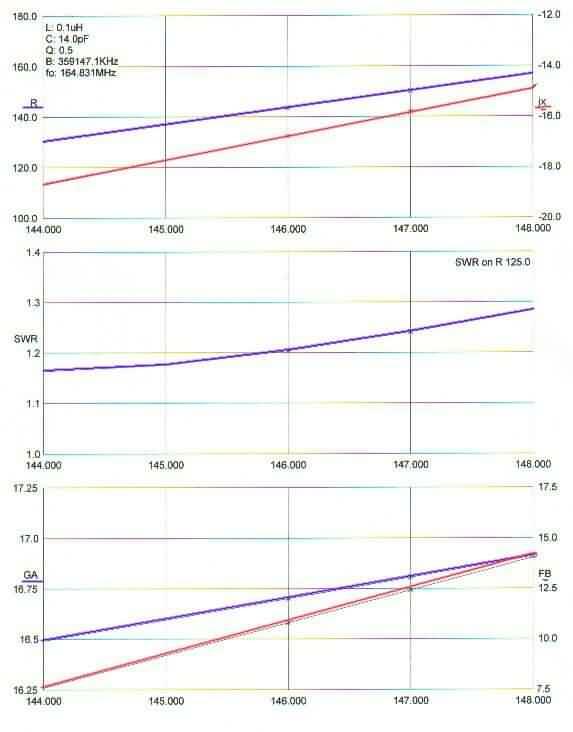 Compare them for gain and SWR.